Registration is expensive. The conditions might be awful. Which course should I choose? I can’t commit in advance. A handful of doubts prevent skiers from signing up for their first-ever avalanche course. 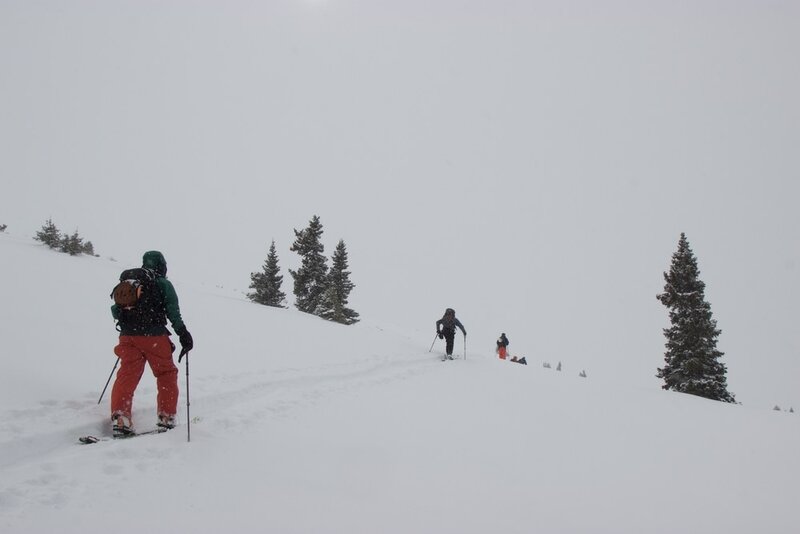 If you’re curious about backcountry exploration or already dabble in off-piste terrain, consider taking an AIARE 1 class—especially if you plan to head into avalanche terrain. Last season, 25 lives were lost nationwide due to avalanches—ten of which were skiers—reports the American Avalanche Association. By a wide margin, Colorado is home to more deaths caused by backcountry slides than any other state in the country, according to the Colorado Avalanche Information Center’s statistics from the last 70 years. AIARE (pronounced air-ee) provides avalanche education to more backcountry travelers than any other U.S. organization. AIARE (American Institute for Avalanche Research and Education) launched in 1998 following an increase in the popularity of out-of-bounds recreation. The nonprofit’s mission? To create a consistent curriculum nationwide. Ultimately, learning AIARE’s decision-making process helps skiers prevent avalanche-related incidents. Today, more avalanche education resources are popping up in response to the growing demand. Across the U.S., 3.2 million skiers now drop into the backcountry via ski lifts. Another 930,000 ski tourers push straight into the wilderness, reports the SIA (Snowsports Industries America) 2017 Participation Study. Two years prior, only 2 million skiers and snowboarders explored non-lift served terrain. Looking to follow the trend? 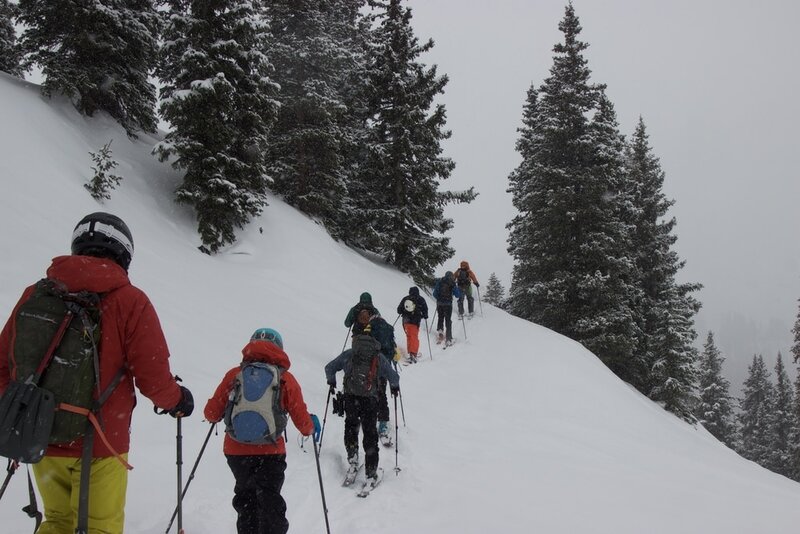 We caught up with Eric Whewell, Risk Management Director at Colorado Mountain School, for tips on how skiers can prepare for their AIARE 1 avalanche course and how they can get the most out of class. AIARE Level 1 courses are offered in ski regions across the country, from New England to Washington. Morgan Tilton: Tell us about your backcountry career. Eric Whewell: I’ve worked at Colorado Mountain School for 11 years and guided for 15 years. I’m also an IFMGA/AMGA certified guide and an instructor team member for the American Mountain Guides Association. MT: What type of skier is a good fit for AIARE 1? EW: Anyone can take the course, regardless of experience level in avalanche or backcountry terrain. The program introduces you to decision-making in avalanche terrain and can be completed on skis, snowshoes, or a splitboard. The goal here is to educate people, so people should not feel intimidated. I encourage everyone who is going to be a backcountry traveler to become educated and invest in their own education. Students should already have experience outdoors in the winter: If you’re unable to take care of yourself—like, layering well—in that environment, it can compromise learning objectives. MT: What knowledge should skiers have before they dive into AIARE 1? EW: Familiarity with avalanche terminology can be helpful before enrollment, but otherwise, the barrier to entry is quite low. It’s also certainly helpful for students to watch Know Before You Go, go to an avalanche awareness clinic, and complete any pre-course reading. MT: What are great resources for skiers to familiarize themselves with avalanche terminology? EW: We recommend two books, both informative and written by equitable authors. The Avalanche Handbook, which reads like a textbook—so it can be a bit dry. The other book is more user-friendly: Staying Alive in Avalanche Terrain. MT: What ability level should skiers have prior to AIARE 1? EW: It’s important for skiers to have a high riding ability in variable conditions in the backcountry. In addition, it’s important for them to have a good foundation in uphill travel technique, such as kick-turns. If they do not have good uphill and good downhill skills, it can compromise the learning objectives for individuals. AIARE 1 is not an intro to backcountry skiing course, so having those requisite skill sets will really enhance the students’ experience. MT: How can folks gauge if their touring ability is adequate for AIARE 1? EW: Most AIARE 1 students have a background in resort skiing and are familiar with downhill travel. They mostly have experience in skiing on powder, out of the gates [into backcountry], on groomers, or in the park. But, resort skiers can sometimes lack skiing ability on variable conditions. If skiers can ride black diamond and double-black diamond runs, typically the variable terrain in the backcountry is within their skill level. For uphill skills: I recommend that people get familiar with their ski tour setup and are able to operate that beforehand. MT: Prior to formal avalanche education, where can skiers safely practice honing their uphill skills? EW: At the very least, people should practice in their home living room. Skiers can also get an uphill travel pass at a ski area. They should be in a controlled environment in order to eliminate avalanche hazards. They can also go to a flat area, where there isn’t avalanche terrain at all. Practice should include taking the skins on and off; getting familiar with putting the bindings in tour mode versus ski mode; and adjusting the comfort of the boots on the way up. MT: Should students own avalanche equipment before they attend AIARE 1? EW: In the program, we talk about various types of probes, beacons, and shovels. And, we do provide that equipment for students to use during the course. Some people make really good decisions about their equipment—a beacon, shovel, and probe—and purchase it before they come to AIARE 1. Other people may not have enough experience or knowledge to choose the best equipment. For the latter, it’s better for them to rent the equipment. They can learn more about their preferences and how to use it, and then buy their own. They can make an informed decision about their purchase. Each AIARE 1 is slightly different regarding the gear that they provide for students. We do not provide backcountry skis. Some guide services have ski rental fleets. Our students usually rent skis from a retailer or bring their own equipment. To get the most out of your first avy course, make sure you’re familiar with your touring gear and how it works. MT: What can students expect to learn during AIARE 1? EW: AIARE 1 is a 27-hour course with 40-percent classroom work and 60-percent field practice. Companion rescue is discussed on day one, followed by learning the decision-making process and examining case studies. We learn the various avalanche types and their characteristics, and how to plan a backcountry tour. Day two is an observation day. 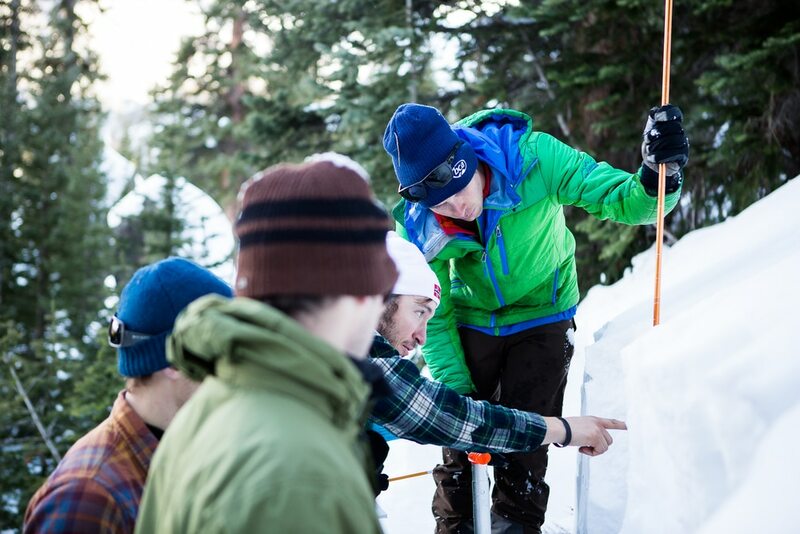 In the field, students study the formation of layers in the snowpack. 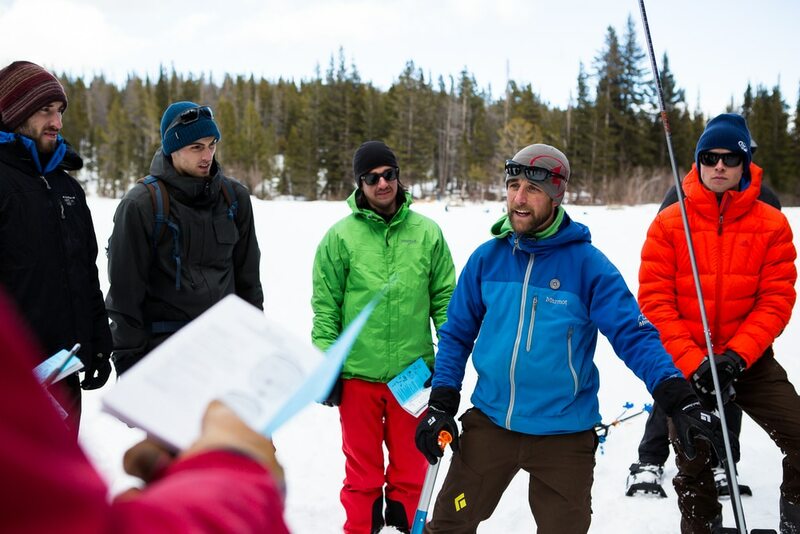 Day three is a student-led backcountry tour with instructors, followed by a debrief of the overall learning outcomes and the next steps for everyone. MT: Last year, AIARE updated course offerings to include a professional track versus a recreational track. Tell us about the change. The recreational track includes courses for the general public—people who will not be paid to be in avalanche terrain. The recreational program is tailored toward a particular demographic: the standard backcountry skier who goes on weekends. The professional track is for overall workplace safety and for someone who makes a living in that terrain: avalanche forecasters, ski patrollers, or alpine guides. There is a much higher barrier to entry with an application process and admittance. Each program includes an examination component. Check out the AIARE course offerings at Colorado Mountain School, and read more about AIARE course prerequisites at avtraining.org.